Fruits and Vegetables are Now Weenies! In 1936, a group of doctors sounded an alarm to the US Senate. It was a dire warning that the mineral content of the soil was eroding. Vegetables were losing their power and people were at risk. Congress did nothing and today we're feeling the effects. Just look at the loss of vitamins and minerals in fruits and vegetables today compared to 1975. These are the USDA's own numbers. The vitamin and mineral content of our fruits and vegetables has dramatically plummeted - in just 34 years! Notice that minerals like iron and magnesium have dropped by more than 80 percent. That's from commercial farming and powerful fertilizers that practically sterilize the soil - leaving it with little to no mineral content. How Can We Get the Vitamins and Minerals We Need? Regardless of where you live, plan and plant your own Vegetables. Even if your space is limited use containers, borrow a plot form neighbor..
Those readers who live in Northern California have the opportunity to secure Quality Organic Compost from Compost Solutions and their Garden Center distributors. Making you own Compost is a relatively easy task for any size garden. but the time in the Garden would be too short if we just did Tomatoes. 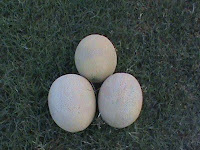 Melons, of Several Varieties, have always been part of our Crop plan. because they don't ship well. Today we grow the varieties in a small patch of Garden area approximately 20x30, and we do use Trellises (we use Horse Panels 12' long 4 rail, because they are Sturdy and portable). Our yield still exceeds our need and we "sell" the surplus ( usually $3-5 per melon) to anxious neighbors who don't have time to Garden. For melons, I encourage finding a well drained piece of ground, with adequate Sun. Al of the seed catlogs mention full sun, but I have good luck with 70-80% sun which helps cool in our HOT 100+ summer days. Subscribe to our Recipe Newsletter and enjoy cooking your Fresh Garden Vegetables. Visit our Squidoo Lens for More Information on Gardening for Profit. It has been a few weeks since my last post. Our 250 square foot Garden has been Sustaining us Very well the past month, with tomatoes just starting to ripen nicely in the past few days. We only planted 12 Tomatoes and have posted a Video update on Pruning. Our method of Pruning is focused on Yield and not pretty Plants. We have always gardened with the thought of providing Produce for our total needs and that of our selected Restaurant customers. Decided to Start (a Bit late) a Three Sister's Garden using Annie Haven's Manure Green tea as the nutrient Source. I have experienced excellent results so for this year with my Tomato and Crenshaw Melon applications. Annie Haven is blessed with knowledge, passed down through her family, about How To enjoy Sustainable Gardening and Agriculture. I remember listening intently to her Uncle Archie Haven explain to me in the 1960's How to Grow Fabulous Sweet Corn and Tomatoes. Want to Grow Maximum Yield in you Tomato Garden? A closer Look at Pruning your Tomato Plant for Optimum Yield. Pruning the superfluous Lateral branches forces Vigor to the New Budding and fruit set. Help keep your plants happy and healthy!